Balanced between salty, sweet & spicy, these portable turnovers are one of my favorite party foods. They’re not messy and also can be quite filling, so you don’t have to worry about your guest leaving hungry. Made in so many variations, there is very little room for error when making these. 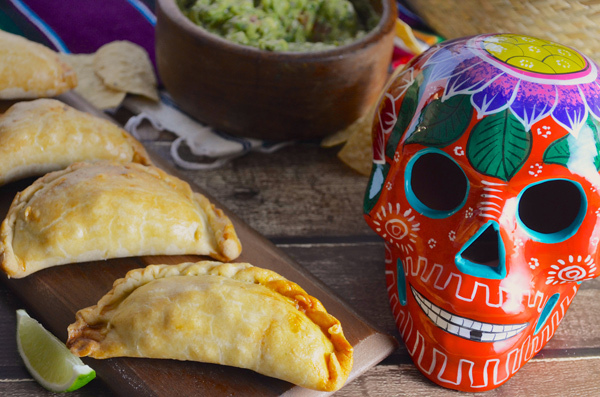 Meat turnovers are found in dozens of countries, really making potential combinations infinite.I encourage you to get creative come up with your ideal combo for a filling! Once the beef is fully cooked and the potatoes are easily pierced with a fork, remove from the heat. Add in raisins, olives & cilantro. Adjust salt & pepper to taste. Preheat your oven to 400 degrees. Fill the center of your dough disk with a heaping spoon of filling. Fold over and press down seams. To close you can either twist the edges, or press down with a fork. Brush the tips and sides with egg wash, and bake for 30-35 minutes until tops are lightly golden.